Coming up at the beginning of June is a Baby Shower for two friends who are both due in June. One is having a boy, the other a girl. Back in December, I bought some 100% acrylic yard that were good baby colours to be eventually knit into baby throws for my two friends. I finished the first one while we were driving down to Anacortes, Washington, on Friday evening. Lets just say, I was/am stoked to have this finished since it has been a 5-month project. I came home tonight to see the Tweed Baby Blanket that brooklyntweed created and it’s beautiful – and I really love the effect of the garter stitch knit on the diagonal compared to the straight square like mine. I’m actually really happy with my finished project but I was taken by surprise when I saw his because I had, like him, completely made it up as I went along! 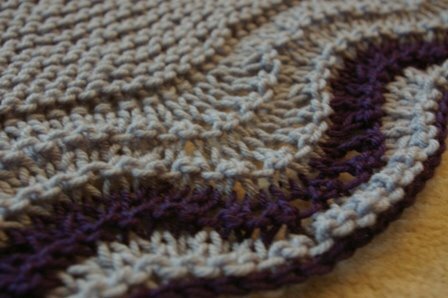 I was actually flipping through old Barbara Walker Treasury books before we drove out on Friday trying to decided how to finish it and stumbled on one of my favourite old lace patterns: Feather & Fan.